Matthew Roller is a Romanist whose research and teaching are broadly concerned with the literature, history, art, philosophy, and culture of the ancient Roman world. 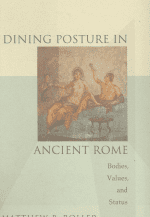 He is the author of two monographs: Constructing Autocracy: Aristocrats and Emperors in Julio-Claudian Rome (Princeton University Press, 2001), and Dining Posture in Ancient Rome: Bodies, Values, and Status (Princeton University Press, 2006). 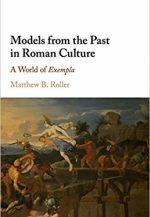 A third monograph, Models from the Past in Roman Culture: A World of Exempla, is in production at Cambridge University Press and is slated to appear in March 2018. This book, which examines the Roman habit of extracting models and standards from the past to guide action in the present, builds on prior articles and chapters Professor Roller has published that investigate aspects of Roman exemplarity: see under the “Articles” tab on this page. Beyond exemplarity, Professor Roller has also published on the relationship between monumentality and memory, on the moral philosophy of the younger Seneca, on reciprocity and social exchange. He is particularly interested in aristocratic competition in ancient Rome, and how that competition develops and changes from the middle Republic to the high Empire. A general investigation of early imperial forms of aristocratic competition constitutes his next large-scale project. Professor Roller’s research has been supported by a Solmsen Fellowship from the Institute for Research in the Humanities at the University of Wisconsin-Madison, a Junior Fellowship from the American Council of Learned Societies, and a Forschungsstipendium (Research grant) from the Alexander von Humboldt Foundation. 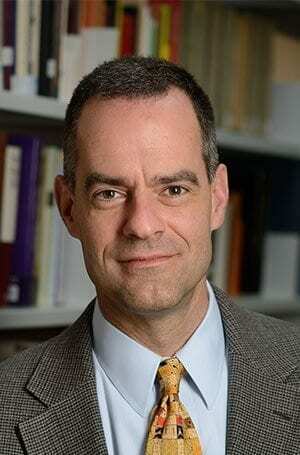 Professor Roller has been a faculty member at Johns Hopkins since 1994. He served as Chair of the Classics Department for seven years, and in 2012-14 led the Krieger School of Arts and Sciences’ decennial accreditation effort. Currently he serves as Vice Dean for Graduate Education and Centers & Programs in the Krieger School of Arts and Sciences. At the graduate level, he has taught research seminars on a wide variety of authors, texts, and topics; he has also regularly taught a Classics Proseminar and a Survey of Latin Literature (an intensive Latin reading course for doctoral students). See CV for full details. “Precept(or) and example in Seneca.” In G. Williams and K. Volk, eds., Roman Reflections: Studies in Latin Philosophy (Oxford: Oxford University Press, 2015), 129-56. “Between unique and typical: Senecan exempla in a list.” In M. Lowrie and S. Lüdemann, eds., Exemplarity and Singularity. Thinking through Particulars in Philosophy, Literature, and Law (London: Routledge, 2015), 81-95. “The Dialogue in Seneca’s Dialogues (and other moral essays).” In S. Bartsch and A. Schiesaro, eds., The Cambridge Companion to Seneca (Cambridge: Cambridge University Press, 2015), 54-67. “Volgei nescia: On the Paradox of Praising Women’s Invisibility.” In A. Avramidou and D. Demetriou, eds., Approaching the Ancient Artifact: Representation, Narrative, and Function. A Festschrift in Honor of H. Alan Shapiro (Berlin: De Gruyter, 2014), 175-83. “Politics and invective in Persius and Juvenal.” In S. Braund and J. Osgood, eds., A Companion to Persius and Juvenal (London: Wiley-Blackwell, 2012), 283-311. “The consul(ar) as exemplum: Fabius Cunctator’s paradoxical glory.” In H. Beck, A. Duplá, M. Jehne, and F. Pina Polo, eds., Consuls and Res Publica: holding high office in the Roman Republic (Cambridge: Cambridge University Press, 2011), 182-210. “Culture-Based Approaches.” In A. Barchiesi and W. Scheidel, eds., Oxford Handbook of Roman Studies (Oxford: Oxford University Press, 2010), 234-49. “Demolished houses, monumentality, and memory in Roman culture.” Classical Antiquity 29 (2010) 117-180. “The exemplary past in Roman historiography and culture.” In A. Feldherr, ed., The Cambridge Companion to the Roman Historians (Cambridge: Cambridge University Press, 2009), 214–30. 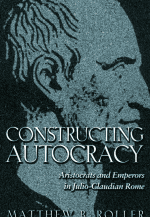 “The politics of aristocratic competition: innovation in Livy and Augustan Rome.” In W. J. Dominik, J. Garthwaite, and P. Roche, eds., Writing Politics in Imperial Rome (Leiden: Brill, 2009), 153–72. “Exemplarity in Roman culture: the cases of Horatius Cocles and Cloelia.” Classical Philology 99 (2004) 1–56.